What would you do if you walked into a tattoo parlor and saw three kids under the age of 13 in the seat getting tatted? 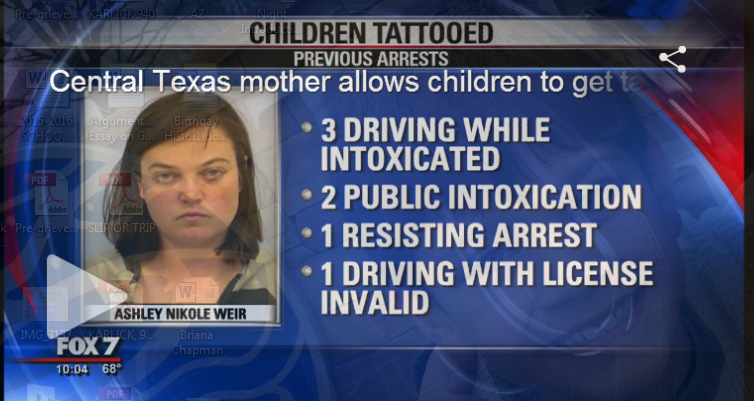 Thirty-one year old Ashley Weir of Texas faces three years in prison on three counts for allowing her three kids to get tattoos. It is unclear about where the children received the tattoos and whether proper hygiene rules were followed. The mother allowed her boyfriend’s brother to tattoo the children in the ankle with a symbol of a cross, an infinity sign with a cross and a heart with an arrow. Weir, who was drunk at the time, warned the children “not to whine or cry,” according to Largo Vista Police. The father found the children unattended and tattooed and reported the incident to the police who then arrested Weir and the boyfriend’s 21-year-old brother who was later found out to be a registered sexual offender. According to San Antonio Express-News, the mother was “passed-out drunk” when the police arrived.